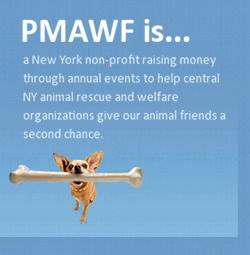 Wayne Mahar and the Priscilla Mahar Animal Welfare Foundation (PMAWF) are proud to announce a new partnership with Galaxy Events Company and Galaxy Media. Canine Carnival began as an idea by Wayne Mahar as a tribute to his mom and has become a major event for Syracuse and Central New York. In eight years it, has grown to become one of the largest animal rescue events in the country attracting 10,000 – 20,000 people and more than 50 rescue organizations. Galaxy Events Company knows how to manage large, successful events. Taste of Syracuse, Lights on the Lake, LEON Festival, and Wine and Chocolate Festival are just a few of the great events Galaxy heads up. Pam Levine, President of Galaxy Events and also an animal lover, sees potential to expand Canine Carnival making an already great event even better while taking on some of the workload of running the event. This year’s Canine Carnival will be Saturday September 15th, once again at Jamesville Beach Park, 10am – 3pm, rain or shine. For information about this year’s Canine Carnival, or to register as a vendor or rescue, please contact us through visit pmawf.org. Email: pmawf08@gmail.com. Thank You for any publicity and your support! This entry was posted on Monday, May 14th, 2018 at 8:12 pm	and is filed under Uncategorized. You can follow any responses to this entry through the RSS 2.0 feed. Both comments and pings are currently closed.